A delicious, creamy, and flavorful dessert with fresh apples and a crunchy streusel. 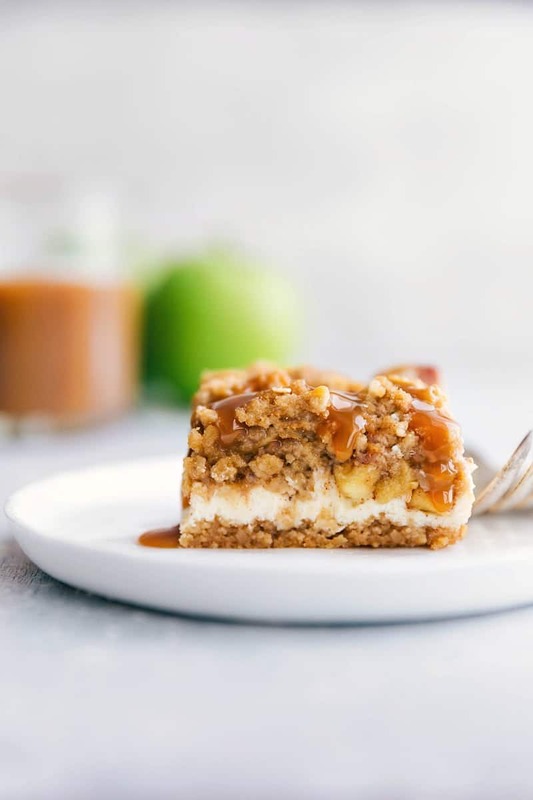 These caramel apple cheesecake bars are served with a caramel drizzle making them the ultimate Fall dessert! 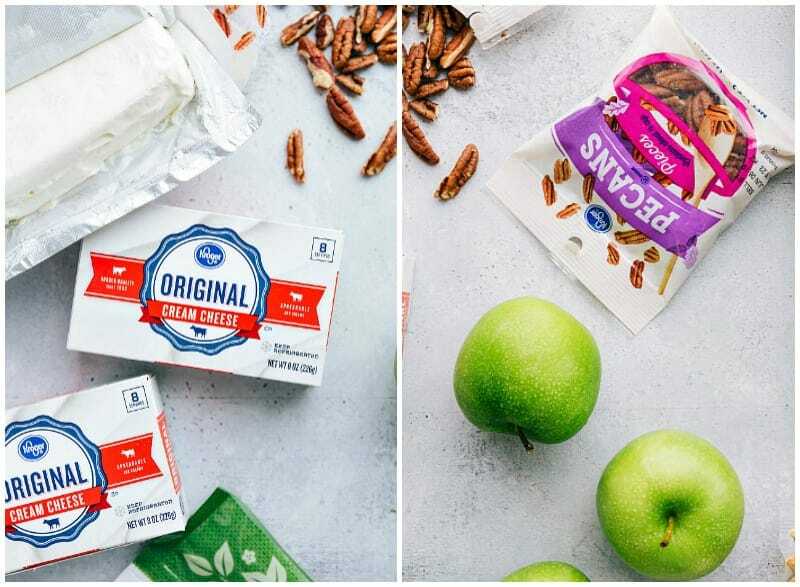 I’m excited to be partnering with Kroger this year to bring you delicious recipes including these Caramel Apple Cheesecake Bars! This post is brought to you in partnership with Kroger, as always, all opinions are my own. 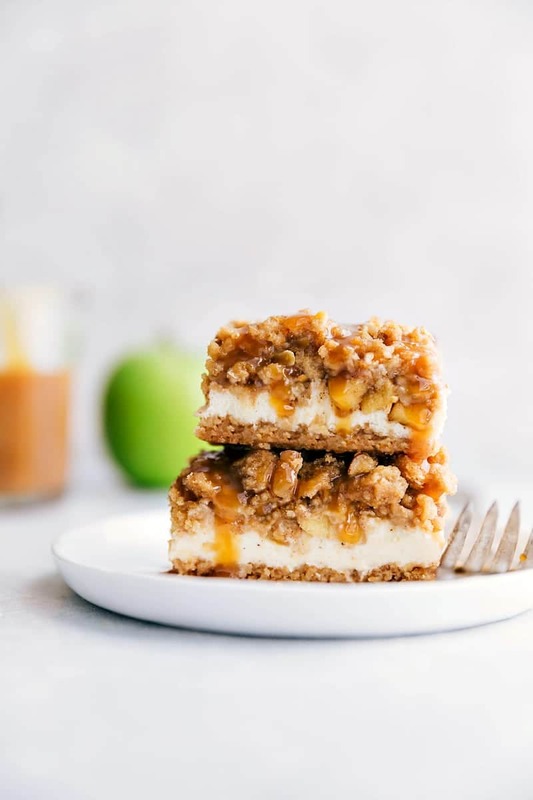 These apple cheesecake bars combine several elements of various holiday favorites into one extremely delicious dessert. These bars are sure to curb those holiday dessert cravings and be a crowd favorite wherever you serve them! 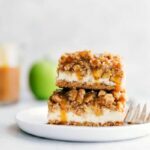 Based off a reader favorite (these pumpkin cheesecake streusel bars), these caramel apple cheesecake bars are every bit as amazing! Throughout this past year I’ve shared many reasons why my family and I LOVE Kroger stores. There is so much to love about Kroger, and my local Smith’s makes my life about a million times easier! My kids, who often hate running errands with me, BEG me to go to Smith’s. They love grabbing a free banana to munch on and they love all the fun carts. And as the holidays are rapidly approaching, Kroger makes it easy to plan and prepare your various holiday menus. Kroger stores are your ultimate resource to #HolidayYourWay — whether you’re planning to throw an indulgent multi-course meal fit for a foodie OR you’re looking for shortcuts like delivery, pickup, Home Chef prepared sides and cooking baking kits, etc. Kroger can fit your needs. In this fun holiday recipe, I’m sharing some of my favorite Kroger ingredients that will help you to holiday YOUR way! Crust – With only three ingredients (cinnamon graham crackers, butter, and sugar) this is one of the easiest, fastest, and most delicious-to-make crusts! Just pulse the cinnamon graham crackers until they are crumbs and mix with the sugar and butter. Be sure to first line your pan with parchment paper, then spread the crust mixture evenly into the pan and firmly press it down. If you don’t have any cinnamon graham crackers available, you could also use regular graham crackers add 1 teaspoon of cinnamon to the mix. Cheesecake – The most important thing to ensure the success of your cheesecake layer is having the cream cheese at room temperature before you begin making this layer. If not, you will not be able to achieve the smooth silky cheesecake texture. It is also important to use full-fat, high quality cream cheese – I love Kroger Brand cream cheese. Beat the cream cheese and sugar together until smooth, then gently beat in the eggs, vanilla, and salt, being careful to not over beat the mix. 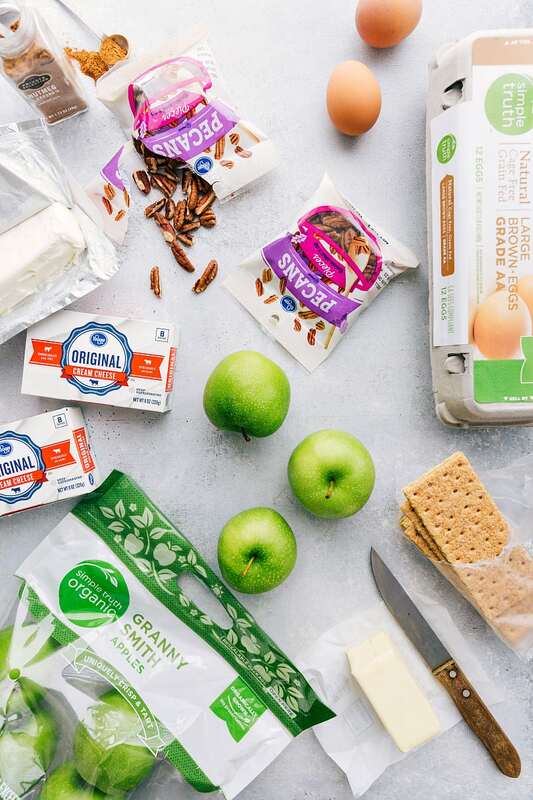 Apple Layer – The secret to this layer is high quality granny smith apples. I love Kroger’s Simple Truth Organic apples! They taste like they were just picked from the tree, they are the perfect tartness and they are really what makes this dessert so delicious! 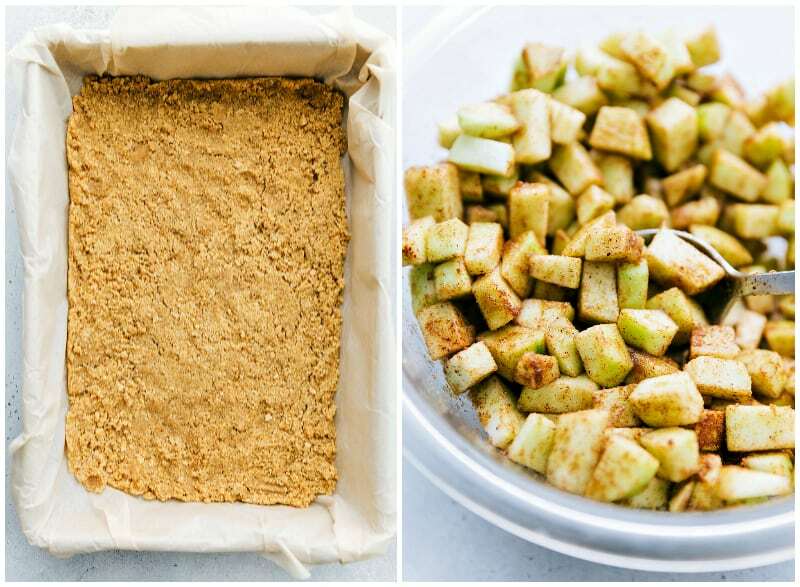 All you need to do to prepare this layer is peel, core, and finely chop the apples and mix with lemon juice, and then toss with cinnamon, nutmeg, and brown sugar. Streusel – This layer pulls everything together to create the perfect dessert, and again, it is super simple to make! All you need to you is mix the dry ingredients together (brown sugar, flour, quick oats, and finely chopped Kroger baking pecans) and then knead in the softened butter with your hands or a pastry blender. Whenever I have a dessert with a streusel, I like A LOT of it. 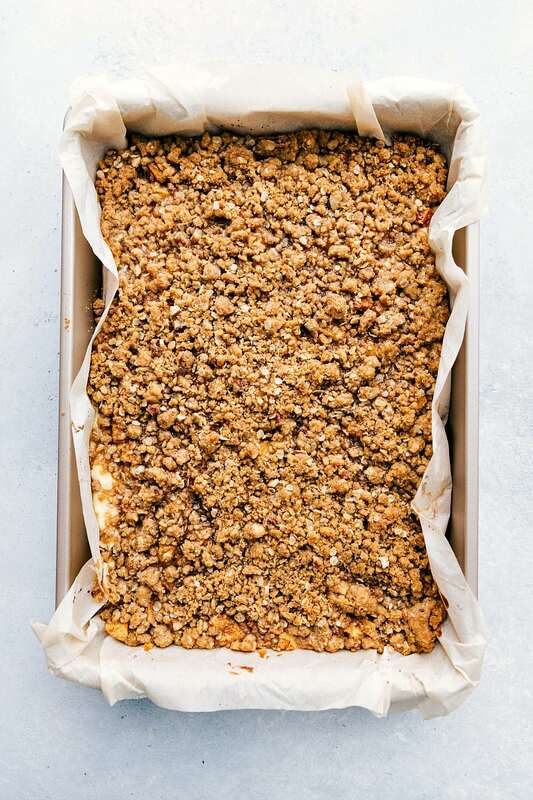 If you aren’t so sure about having a ton of streusel, you can halve the amounts. Assembling the Caramel Apple Cheesecake Bars – Smooth the cheesecake layer over the slightly cooled crust (it should still be warm but not hot). 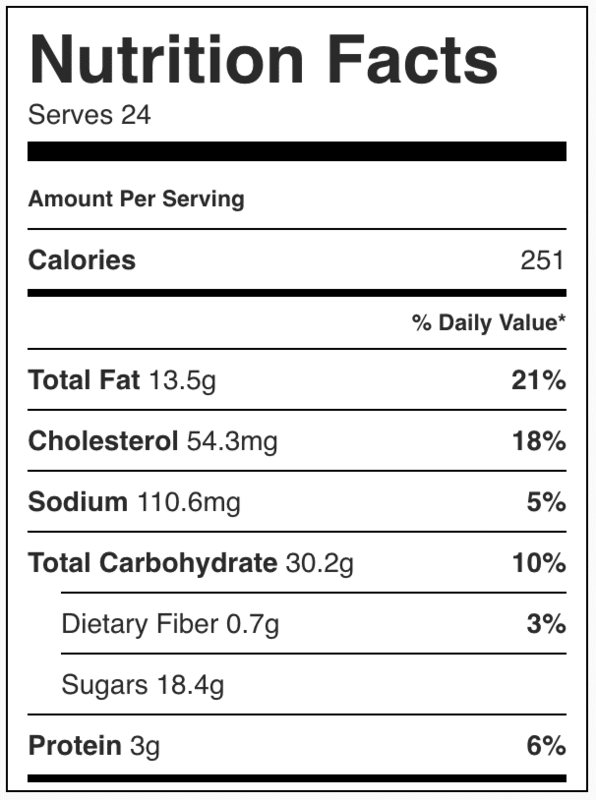 Spoon the apples over the cheesecake layer and then evenly sprinkle the streusel over the apples! Cook for 30 minutes at 350 degrees F or until the filling has set. After that, you just need to wait for the bars to properly be chilled before you can cut and serve them with caramel sauce! The bars need to cool and set completely before you serve them. I recommend making these the night before you plan to serve them so they can set up over night. If you plan to make them the day of, be sure to do them early enough so they can set completely – at the very least, they need to cool for an hour and then be placed in the fridge for at least two hours. This dessert tastes good cold, but it is best at room temperature. I recommend leaving 30 minutes to let them sit out and get to room temperature. These caramel apple cheesecake bars are rich so I recommend cutting smaller rather than larger pieces – this recipe should make 24 bars! The parchment paper makes it easy to remove them from the pan and cut them into sharp, beautiful looking pieces. Another trick I use to cut perfect cheesecake bars: use a HOT sharp knife. I run a sharp knife under hot water, quickly dry it off, and then make one slice into the bars. Run it under hot water again, dry, and repeat! When you are ready to serve them, warm up some caramel sauce to drizzle over them. I recommend doing a thin drizzle of a high quality caramel sauce. Again, Kroger is the perfect way to #HolidayYourWay — whether you pick up one of their delicious pre-made caramel sauces OR grab the ingredients to make one from scratch. Here is my favorite from-scratch caramel sauce recipe. So what’s the difference between streusel and strudel? Although similar in name, these two sweet treats are quite different! Strudel is a pastry made up of a lot of thin layers wrapped around a filling. The most traditional filling is apple, but you can use all types of fruit fillings. Additionally, you can also find or make savory strudels. Streusel, on the other hand, is a sweet crumble topping that is often placed on top pies, cobblers, and other desserts. A delicious, creamy, and flavorful dessert with fresh apples and a crunchy streusel. These caramel apple cheesecake bars are the BEST! Preheat oven to 350 degrees F. Line a 9 x 13 pan with parchment paper. Begin by placing the graham crackers into a blender. Pulse until all the crackers are crumbs. Add in the sugar and melted stick of butter and mix until combined. Press the graham cracker mix into the pan until even and firm. Bake for 8 minutes. While the crust is baking, prepare your cheesecake filling. Begin by beating the three packages of SOFTENED cream cheese and 3/4 cup white sugar together. Beat on low and even speeds. Once smooth, add the eggs, vanilla, and salt. Beat until incorporated and smooth, being careful not to over beat the mix. Let the mix sit until the crust has baked and slightly cooled (it should still be warm but not hot). Pour the cheesecake mixture evenly over the slightly cooled crust. Mixed the peeled, cored, and finely chopped apples with the lemon juice. Toss with brown sugar, cinnamon, and nutmeg. Mix the brown sugar, flour, quick oats, and finely chopped pecans together. Add the cubed butter to the dry ingredients. Incorporate by gently mixing the ingredients together with your hands until the butter holds all the dry ingredients together. Spoon the apples evenly over the cheesecake layer. 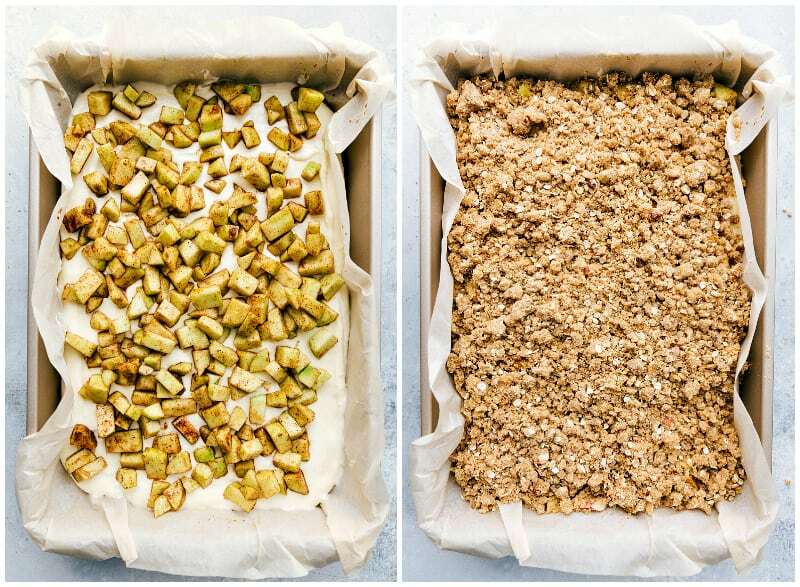 Sprinkle the streusel topping evenly over the bars. Bake for 30 minutes at 350 degrees F or until filling is set. Remove from oven and let stand at room temperature for 1 hour. Transfer to the fridge for 2 hours. When ready to serve, use the parchment paper to pull the cheesecake bars out of the pan. Cut into bars. Drizzle with caramel sauce and enjoy! *The video shows old fashioned oats, but quick oats are the best to use for the streusel! Oh man, I can’t wait to try these out! As much as I love the Pumpkin Cheesecake bars, I think I love apple desserts more! Sounds and looks amazing! Thanks, Chelsea!! !